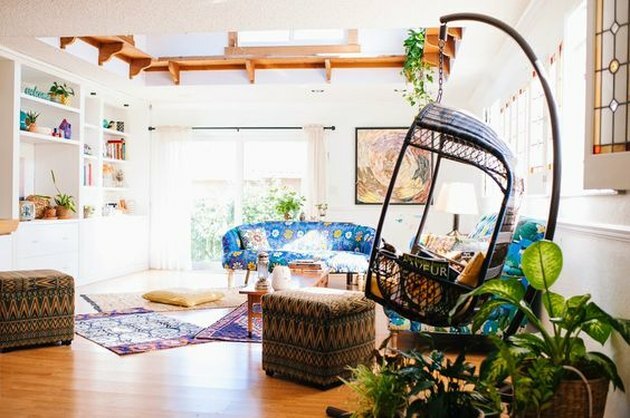 It's no wonder that the bohemian aesthetic has such undeniable appeal: its penchant for worldly patterns and colorful textures gives any space a welcoming, lived-in feel. But, there is a fine line between curated and cluttered. In order to emulate this look in a way that feels relaxed, establish a defined color palette that can work with a variety of tones and textures. Then, incorporate greenery — a must for this type of style — and balance your handful of materials against bright white walls. 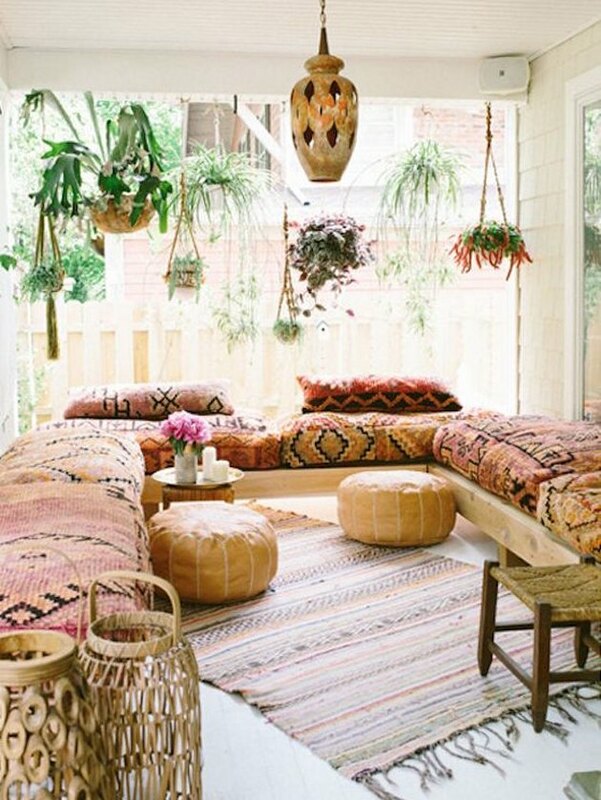 If you're still not sure where to start, we found 14 rooms on Pinterest that will speak to your inner carefree bohemian. 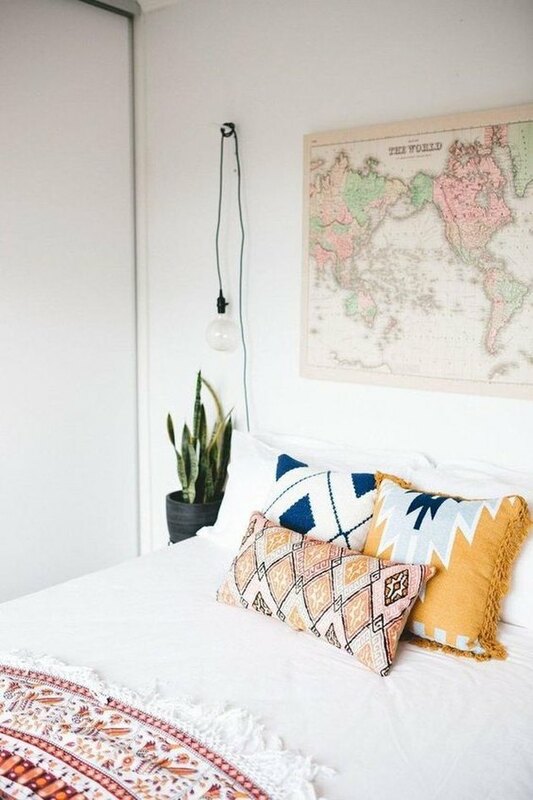 This bedroom may look simple, but it's actually a compilation of subtle layers: the similar tones in the throw pillows and blanket work together to complement the centerpiece of the room — the vintage world map on the wall. Paired with classic white linens and a bare-bones hanging bulb lamp, this space feels peaceful and put together. 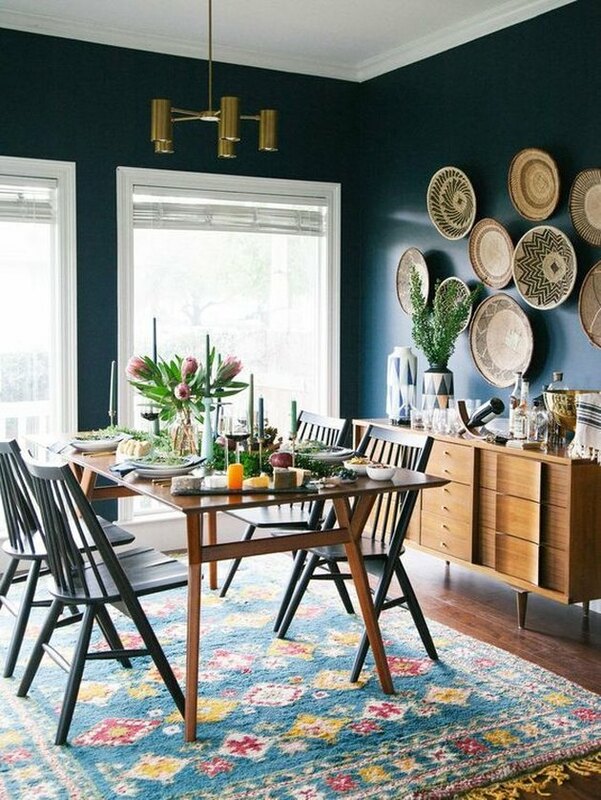 By incorporating a teal accent color in a wide range of shades, this dining nook is able to confidently carry the bright hue without seeming overdone. From the vibrant storage cart to the subdued coffee mugs on the table, this shade gives the space a sense of cohesion. 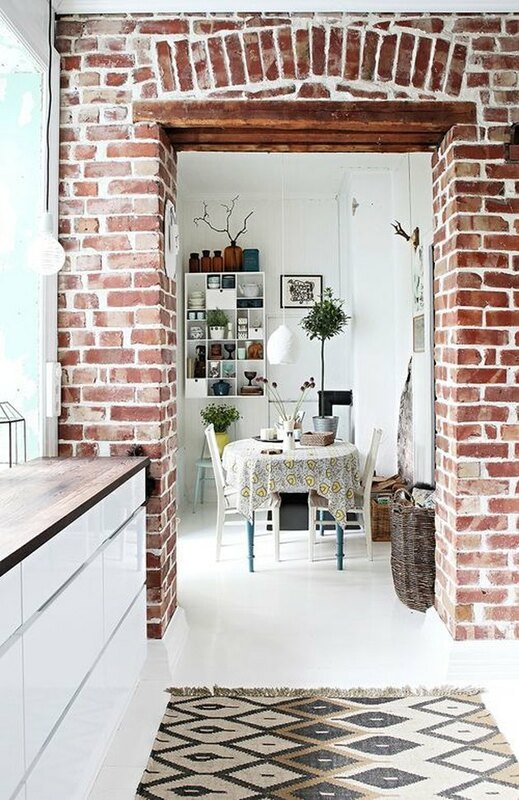 It's no question that the beautiful exposed brick in this kitchen has to be the room's defining feature. The rest of the design is understated, but details — like the tonal brown rug and amber glass bottle collection — work with the brick's rich shades. 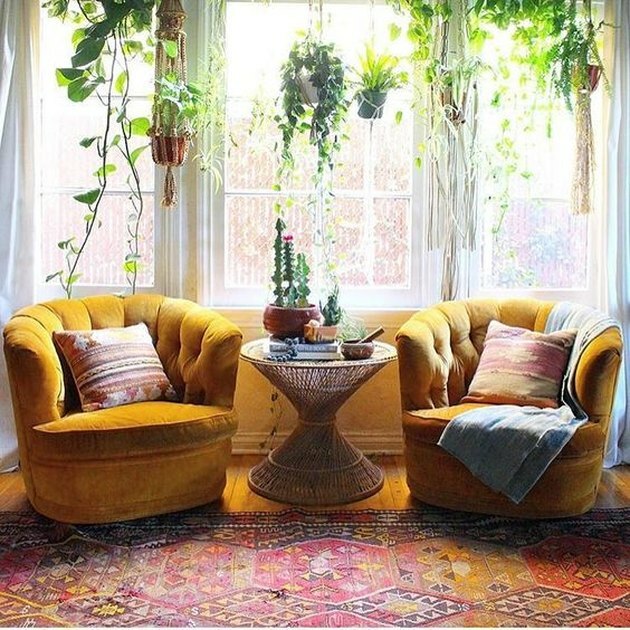 This sun-drenched sitting area is centered around a pair of mustard velvet chairs that seem perfectly at home underneath a canopy of macrame plant hangers and lush greenery. 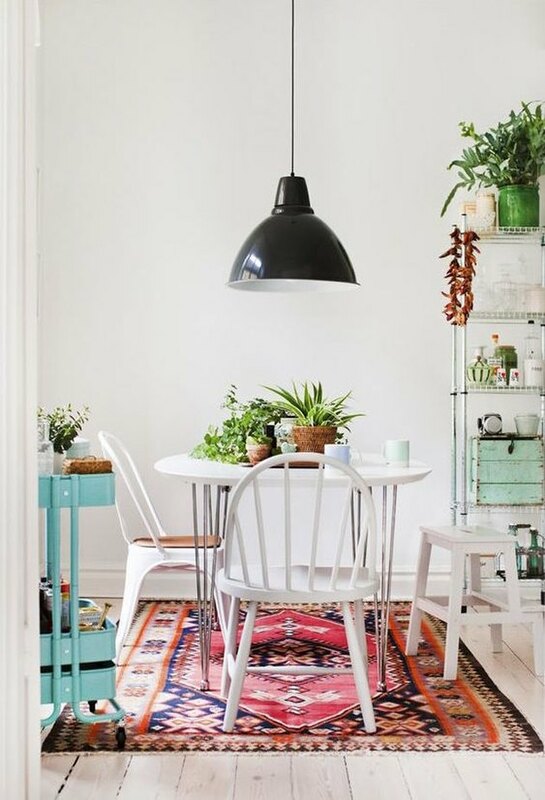 And while it may seem like matchy-matchy elements aren't all that bohemian, the rich texture of the chairs and the vibrant tones of the coordinating rug still give this look an eclectic finish. 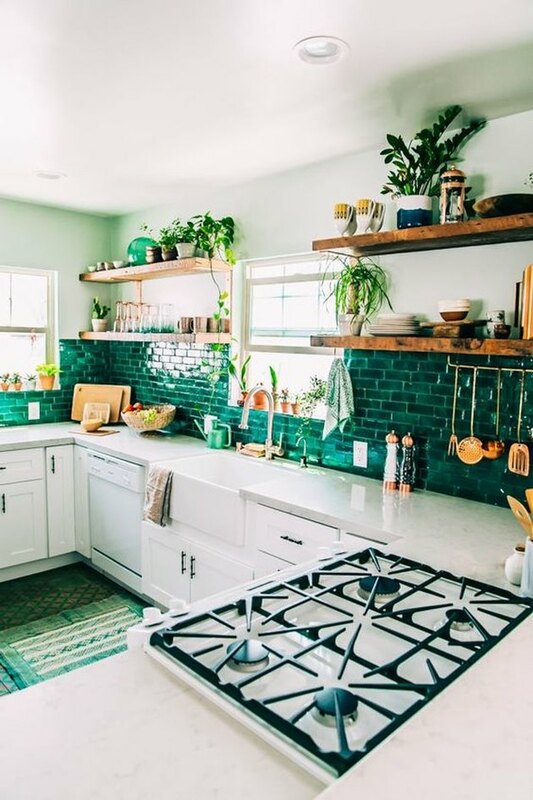 The simple white-on-white cabinetry allows the rustic open shelves and green subway tiles in this bohemian kitchen to command the attention they deserve. Meanwhile, the copper accessories, plants, and curated knickknacks match those tiles while heightening the room's worldly ambiance. The layered photo display in this living room makes it feel like an eclectic art gallery of ever-changing favorites. Meanwhile, the varying shades of purple in the seating and intricate moroccan-inspired lighting contribute a touch of glam to this bohemian dream. This open and airy kitchen is an exercise in restrained bohemian style. 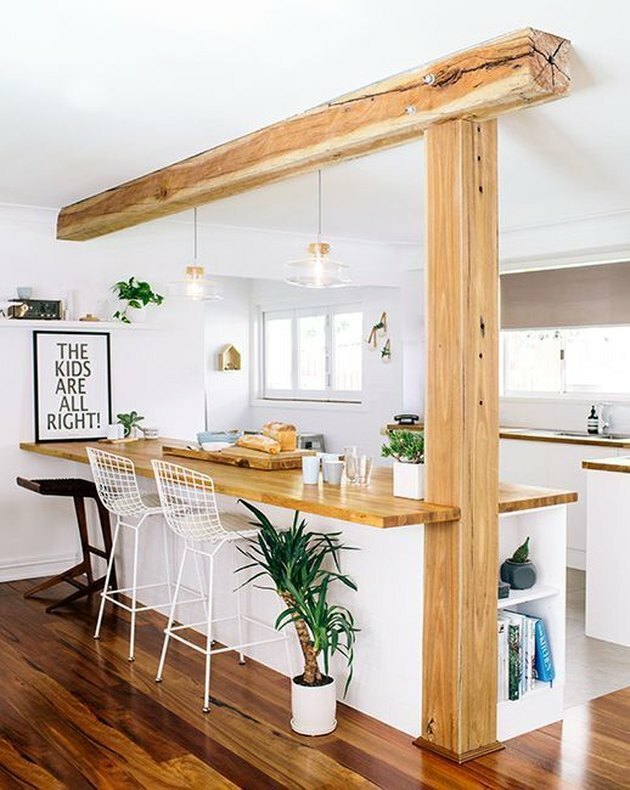 The exposed wood beams are a definite focal point, and they help define the kitchen in this open floor plan. But since greenery is placed at different heights, the eye is forced to take in the whole space. Layering rugs of different colors, patterns, and textures is an effective — and on trend — way to cover more floor space without splurging on a large area rug. 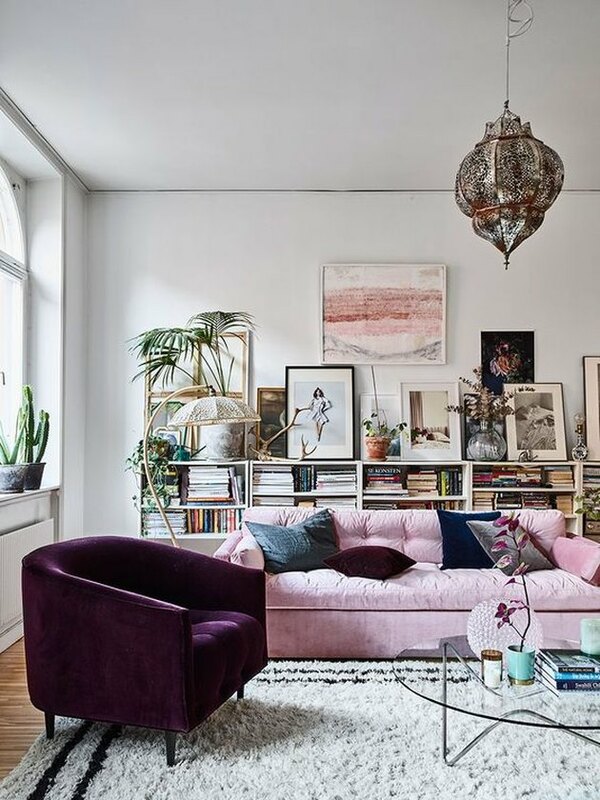 And while this living room makes use of that trend perfectly, it's a visual smorgasbord thanks to the equally bold ottomans and couches nearby. 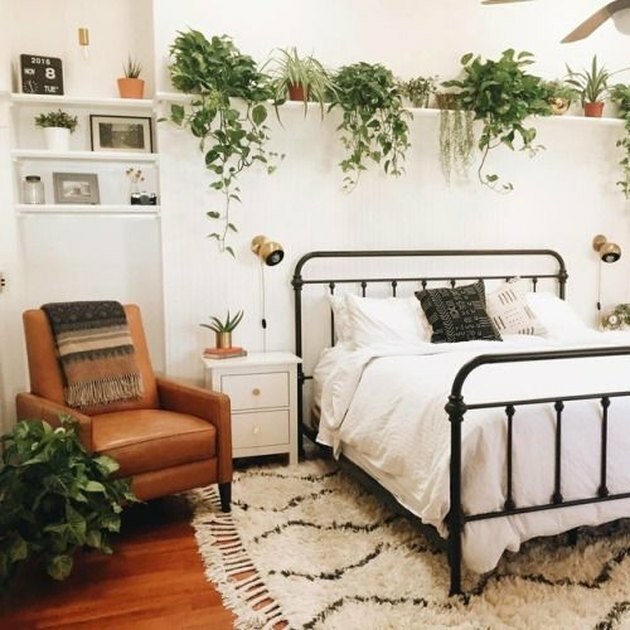 The classic steel bed frame and always-in-style camel leather chair create timeless appeal in this low-key boho bedroom. But the shelf of greenery is the undisputed star of this design show, since it works color and texture into this otherwise minimal aesthetic. The woven baskets seen above the banquet in this dining room feel like an art collection that's been acquired over time. Not only does it command a ton of real estate without the fuss of an ordinary gallery wall, but it also works with a variety of paint colors. Just be sure to get baskets in multiple sizes for dimension. How can you make a larger room feel intimate? Follow the lead of this casual outdoor oasis and use wraparound bench seating. Plush cushions and pillows make the space feel welcoming, and dual-purpose ottomans work as chairs or surfaces. Add hanging plants, too, for height. This Grecian-inspired bedroom leaves the frills to a minimum and lets the details do the talking. 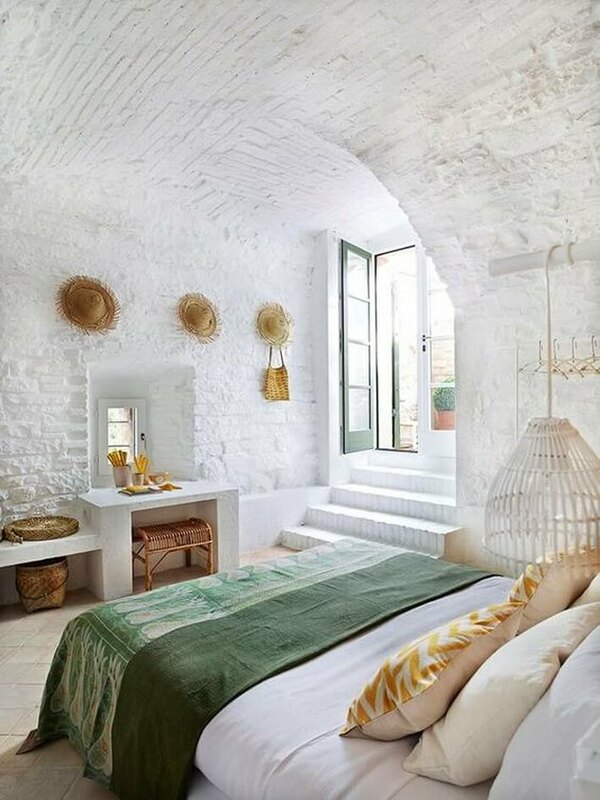 Sparse white brick walls allow for rustic colors to pop, from the scattered wicker accessories to the worn green throw and mustard yellow pillows. 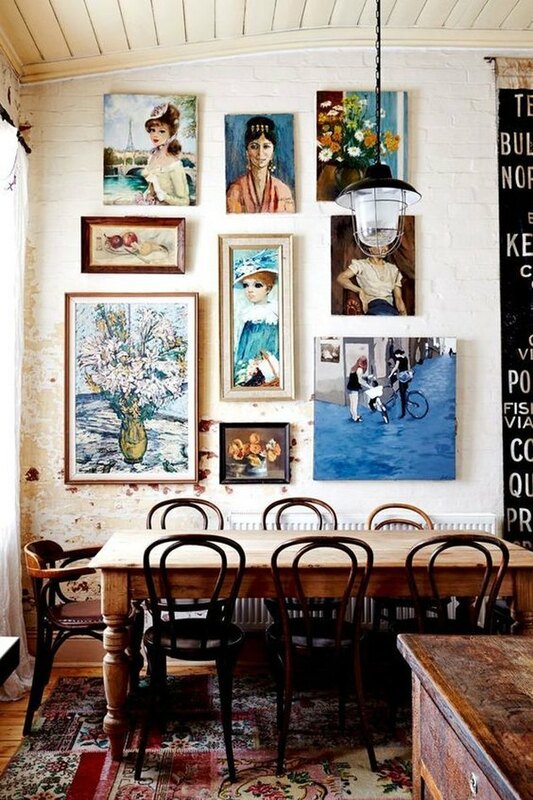 While some parts of this small dining room are quirky and unique — like the full-wall display of vintage paintings — they're balanced by the matching dining chairs and simple light fixture. When you want to really turn up the eclectic vibe of your space, just remember that balance is key.